On September 3rd, Shadow Kingdom Records will release The Innocent, The Forsaken, The Guilty – a collection of rare recordings from enigmatic psychedelic metallers THE MEZMERIST. The Shadow Kingdom reissue will feature a CD compiled of the band’s two EPs, recorded in 1983 and 1985 and a DVD detailing the history of THE MEZMERIST. 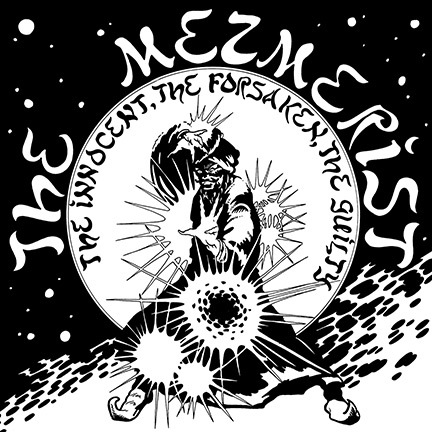 The Mezmerist is one of the most mysterious US Metal acts of all time. Few even know who The Mezmerist is and to find an original LP is a chore as the band held on to most of the copies pressed. Originally issued in1985 and limited to 500 copies, today those copies have gone for extremely high prices on eBay. The Shadow Kingdom records reissue marks the first time anyone who knew about this lost gem made contact with the band. SKR was fortunate in finding the mastermind behind the band – Thomas Mezmercardo. After tracking Mezmercardo down, an additional five years was spent on this release to ensure it was done properly and with all of the parties and work involved. Speaking of all parties involved, one of the most interesting things about this release is that Bill Ward did in fact play drums on the four tracks that make up the 1983 EP. The circumstances surrounding the events back then are somewhat of a mystery, even to this day. Mezmercardo sits down and tells the story of how all of this came together on the DVD portion of the release. The Innocent,The Forsaken, The Guilty is not just any old over-hyped cult release that some of these other labels are feeding you. This is the definition of the perfect lost gem in 80’s heavy metal history and by far one of the best cult classic metal albums you’ll ever hear. Psychedelic Heavy Metal is the most apt way describe this band that offers shades of Led Zeppelin, Cirith Ungol, and Mercyful Fate. LONG LIVE THE METAL LEGACY OF THE MEZMERIST. This entry was posted on June 25, 2013 at 12:05 am and is filed under Heavy Metal, heavy metal albums, heavy metal news, Metal, metal music, Music, rock music, rock music news with tags 1980's heavy metal, bill ward, heavy metal news, metal albums 2013, Metal News, the mezmerist. You can follow any responses to this entry through the RSS 2.0 feed. You can leave a response, or trackback from your own site.